I’ve found myself eating less meat during the week and preparing more vegetable based meals. I now consider meat a treat to be enjoyed at weekends and I think I tend to buy higher quality, locally sourced produce as a result. Frittata is a dish I make again and again over summer. 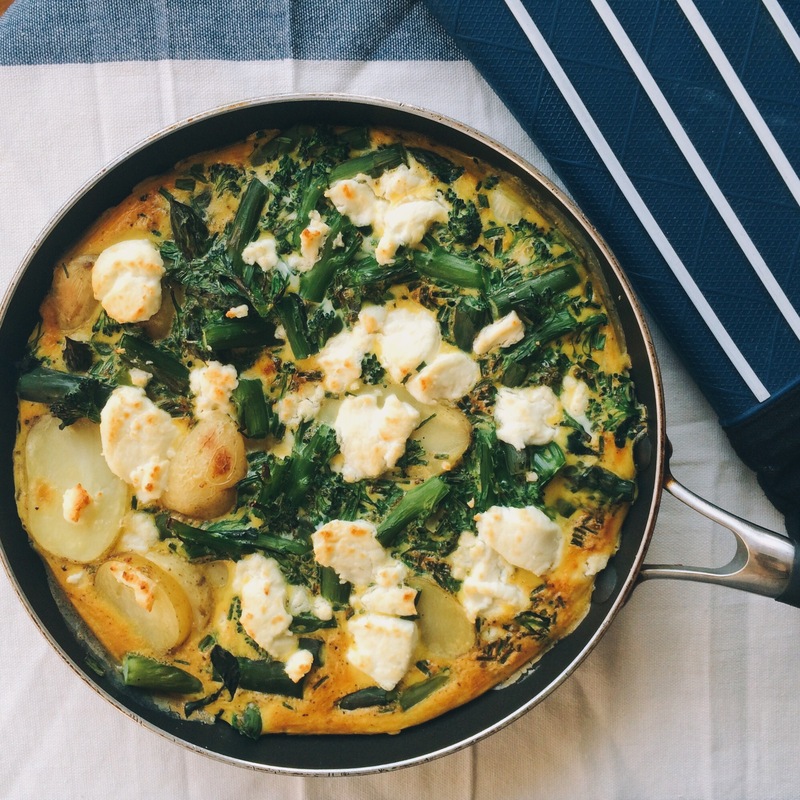 It’s great for using up lots of green veg, potatoes and spare eggs you have in the fridge. Cut new potatoes into 5mm slices. Put into a large pan of water, add salt and bring to the boil. If using cut asparagus into 3-4cm lengths, cut broccoli into small florets. When potatoes come to the boil, add the green veg. Once water comes back to the boil, reduce the heat and simmer for 3-4 minutes. Drain well. Preheat oven to 180°c (160°c fan) gas mark 4 or preheat grill to medium. Heat olive oil in a 28cm frying pan over a medium heat. Add the spring onions and sweat for around 5 minutes until soft. Add the drained vegetables and herbs and toss with the onions. Beat the eggs together with plenty of salt and pepper and pour over he veg in the pan. Cook gently, without stirring, until the egg is about two thirds set, with a layer of wet egg still on top. Crumble the cheese and scatter over the surface of the frittata then transfer the pan to the oven or grill for a further 4-5 minutes until the egg is set and the top is starting to colour. Mine wasn’t set after this amount of time under the grill so I gave it a little longer and popped it into the oven to firm up the middle too. Leave to cool slightly then slide the frittata out on to a plate or board. Enjoy!